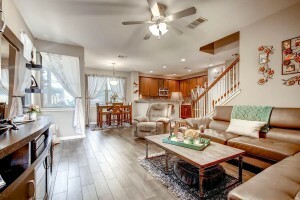 This gorgeous home is located in South Austin in the Enclave at Westgate neighborhood! Enjoy the inviting charm of an arched entryway and open downstairs floor plan with beautiful flooring throughout. The kitchen features a nice breakfast bar top, a whisper quiet dishwasher and crushed granite kitchen sink. All three bedrooms provide great space, nice natural lighting, and unique design features. Don’t forget the bonus area upstairs that could be used as a small office or workout area! This home offers an unbelievable amount of storage and a beautiful, low maintenance yard!